The KORG Headtune has a unique design that's based on the headstock of your ukulele. Headtune makes tuning easy with two illuminating indicators. Play a single note on the string you want to tune and the built-in piezo pickup will detect it straight away. An LED will show the peg position and another LED meter indicates the tuning. Making tuning especially easy for beginners, the note names of each open string appear on the tuner. This ukulele model detects 'Low-G tuning' with the 'G' tuned one octave down, supporting solo performances that cover a wide pitch range. Tune from a natural position by adjusting the angle of the Headtune by raising the meter display section to a maximum of 120 degrees. The indicator LEDs ensure easy visibility even in dimly-lit locations with a wide viewing angle and high contrast. The Headtune uses the same highly stable clip as Korg's reliable pitchclip tuner, securely attaching to the headstock of your guitar. The Auto-Power off feature prolongs battery life by shutting off the tuner when it's not in use after 10 minutes. The lithium coin battery provides the headtune with approximately 35 hours of usage. 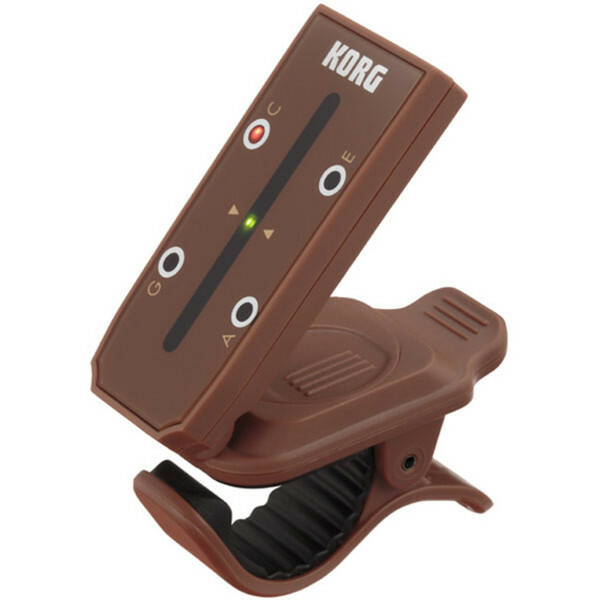 Korg innovation and precision makes the HeadTune lightweight and compact for easy portability.